Woolsthorpe is a rural village in western Victoria, situated near the junction of roads running north from Koroit and Warrnambool. It is beside the Spring Creek and is 23 km north-west of Warrnambool. It was probably named after Woolsthorpe in Lincolnshire, England. 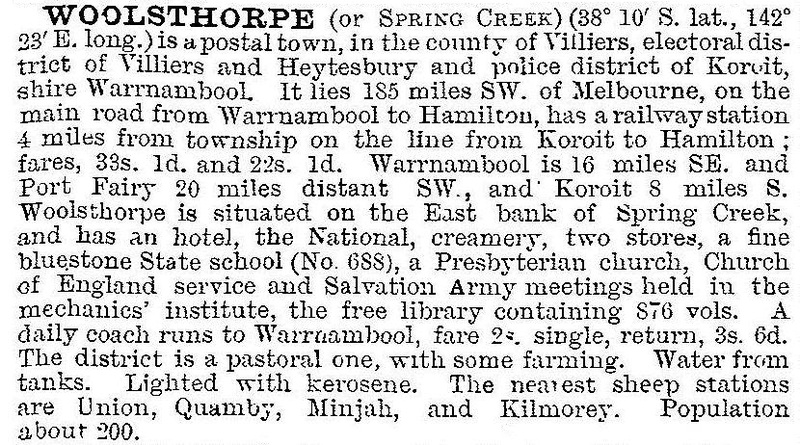 Pastoral settlement in the Woolsthorpe district began with the Quamby pastoral run in 1845. After the arrival of farm settlers a school was opened in 1864. A hotel was recorded there in 1865. Until the 1960s Woolsthorpe maintained populations of around 200 people, and the basic village facilities of general store and hotel have survived. An additional dining facility came with the conversion of the Quamby homestead (1888) to a bed and breakfast establishment. Woolsthorpe also has a Uniting church, a public hall and a recreation reserve. Catholic families worship at St Columba’s, Winslow. Its school had 91 pupils in 2014. About one third of employment in the Woolsthorpe district is in farming, including one tenth in dairying.